Miss Merivale, Barton Place, no. 23. Along with this work, James Curtis also ordered a copy in oils of Towne's most famous watercolour, Ariccia. The Ariccia oil (Private Collection, U.S.A.) is the same size as the watercolour. Lake Albano is an evening view, and Ariccia is inscribed 'morning'. 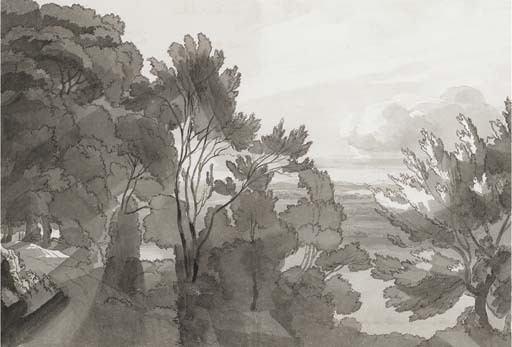 Towne's particular twist on this 18th-century convention of pairs of views with contrasting times of day is that the Evening and Morning are of the same night, the present Lake Albano watercolour is dated 10 July 1781 and the Ariccia view (British Museum, see Wilcox, op. cit., p. 59, fig. 20) is dated 11 July. We are grateful to Tim Wilcox for his help in preparing this catalogue entry. by whom sold to Nigel Warren, 1955.